What is the Biketober Business Challenge? The Biketober Business Challenge is a fun, free cycling campaign to encourage your colleagues to experience first-hand the joys and benefits of riding a bike. Simply ride a bike for as little as 10 minutes during October. There will be lots of prizes on offer to tempt everyone to get involved. Get Healthy at Work has joined with Love to Ride to create the Biketober Business Challenge. It's completely free to join and is open to everyone who lives or works in NSW. The Biketober Business Challenge is all about encouraging people to ride a bike. Workplaces will compete against each other to see who can get their staff to ride a bike, and continue riding. It’s not just about who can cycle the furthest or the most often, but who can encourage the most people to give cycling a go. Individuals are also welcome to take part and are eligible to win spot prizes as long as they live or work in NSW. 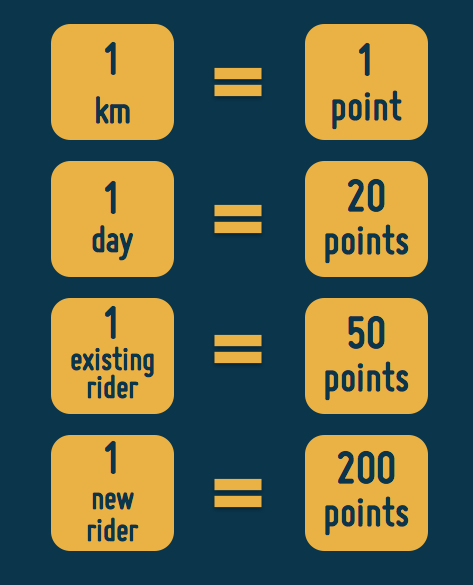 You earn points by riding and encouraging others to ride as per above. Your organisation earns points for all the people you get to join your organisation and all the riding you all do. The top workplaces in each of the 7 size categories will win prizes as well. Organisations and departments will compete against those of a similar size for a fair chance of winning. There are 7 size categories: 2,000+ staff, 500-1,999 staff, 200-499 staff, 50-199 staff, 20-49 staff, 7-19 staff, 3-6 staff. Your participation will count towards your department's and your organisation's score. What are the benefits to your organisation? Ride a bike anywhere, anytime for at least 10 minutes between 1-31 October 2018. Record your ride here and tell your friends and workmates about the Challenge. Reward yourself - go in the draw to win prizes.